More Americans are using a smartphone, with a slight increase in adoption since the end of last year. comScore has released the data on key trends within the U.S. smartphone industry for February 2015. Apple ranked as the top smartphone manufacturer with 41.7 percent OEM market share, while Google Android led as the number one smartphone platform with 52.8 percent platform market share. 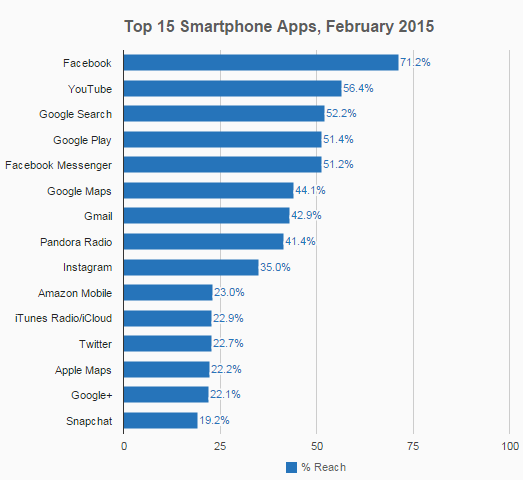 Facebook continues to rank as the top individual smartphone application in America. Meanwhile, a variety of Google apps dominate the top 15 software applications list, and Snapchat entered the list for the first time. 186.3 million people in the U.S. owned smartphones (76.6 percent mobile market penetration) during the three months ending in February 2015 -- that's up by 5 percent since November 2014. Apple ranked as the top OEM with 41.7 percent of U.S. smartphone subscribers. Samsung ranked second with 28.6 percent market share, followed by LG with 8.3 percent (up 0.7 percentage points from November), Motorola with 5.1 percent and HTC with 3.8 percent (up 0.1 percentage points). Google Android ranked as the top smartphone platform in February with 52.8 percent market share -- that's up by just 0.2 percentage points from November, followed by Apple iOS with 41.7 percent. Microsoft Windows Phone continues to trail the leaders with 3.5 percent market share (up just 0.1 percentage points), BlackBerry with 1.8 percent and Symbian with 0.1 percent. Facebook ranked as the top smartphone application, reaching 71.2 percent of the software app audience, followed by YouTube (56.4 percent), Google Search (52.2 percent) and Google Play (51.4 percent).